Critical Dance Studies, Modern Dance Technique, Choreography, Dance & Technology. 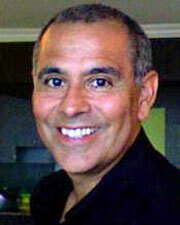 James Moreno is a dance studies scholar and choreographer working at the intersection of practice and theory. He uses performance as a way to think, theorize, and ask questions about the ways that people use their bodies to create meaning, develop communities, and respond to social systems. His research has been presented nationally and internationally and his manuscript, The Dances of José Limón and Erick Hawkins is under contract with Routledge. Moreno’s choreography has also been presented nationally and internationally and his recent project, Margins was shown at Links Hall in Chicago in 2017.